OK everyone it's time to put this together as sooner or later this winter is going to FINALLY end! I'm looking into doing a group buy for us members here on TCCA for some shirts with the site logo on them. These would especially great for anyone putting together a local/regional meet or for large events like Carlisle, or just showing your colors while working on your Bull. I will be ordering them from Customink.com because they are a very reputable company, their prices are pretty good and there's no sales tax! 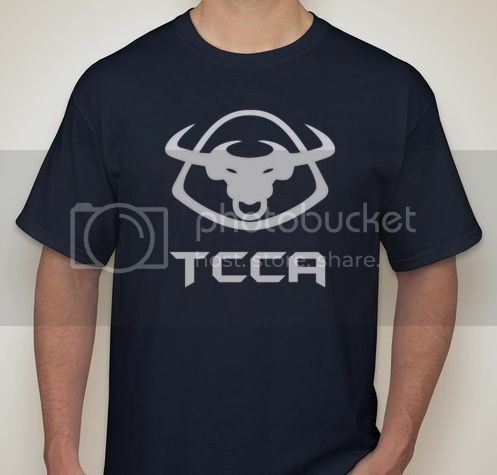 To make it easier on the pockets, it will be front only printing with the Bull/TCCA logo. Here is what I came up with a BIG thanks to Paul(TaurusDailyDriver) for the artwork! LET ME MAKE THIS CLEAR.......... I WILL NOT be charging any extra money for this! I would be doing this for the community and not for profit. Shipping is free(2 week delivery) to me, but you will have to pay shipping/packaging to you which is added in the costs below. These will be Gildan 100% Cotton, pre shrunk cotton shirts. Remember...... I'm doing this as an unpaid service to our community so only say you want to order if you are commited to purchase! I'm going to run this till March 9th. On March 1, I will count what we have in the way of an order and give you a final price. You can pay with check mailed to me, or paypal(send friends in family or pay fees) so we can get the order placed. Prepayment will ensure that you get your shirts first!! They have a 2 week turn around to me, then I have to ship to you once I get them so obviously that would take a little more time. Sam is able to accept Credit Cards (with $1 extra charge due to the cost of running a credit card) if paypal is not an option for you. You may send cash in the mail but FYI that is not supposed to be done and may not arrive. Paypal is recommended, but credit cards are an option. Post here what you would like, the size, and quantity you would like. If you can just use the link above and BUY IT NOW! Last edited by sousa632; 02-16-2015 at 08:31 AM. The order this is in is the order you get your shirts (For Paid People). Last edited by sousa632; 03-03-2014 at 08:58 PM. I'll take one short, possibly two, in XL. Can the logo be centered though? Thoughts on this? OK guys I think we have a solid design! I changed the pictures to reflect the changes, and cleaned out what we worked on last night. It'll be a front design only(nothing on the back) just to make it a little easier on everyone's wallets. Anyone going to Carlisle really should have one of these shirts Let me know what you want, cause the more we order they cheaper they get. Plus there is a 6 minimum for the navy color, but I'm sure we can come up with well more than that in T's. I like the design! John, order the 20 Tshirts for sure. If you come up short I'll pay for them and you can send them to me. I like the current design. Put me down for one large t-shirt. Welded, open cone intake, Jet-Hot coated and gutted intake, vanity plate, pretty valve covers. Can you tell me if the design is silk screened or rubberized print? I seem to have a reaction to the rubberized material. Count me in! One Large please! It says "Screen printing or high-quality digital printing". I'm waiting to hear back from the company but I'll confirm that before giving you a yes or no. Put you and everyone else that requested one in. Thanks and keep them coming! !